The “District of Character” is an initiative I created to enhance character development and promote daily reminders for residents of the 189th District about how we can create a stronger community without policy changes. No one is perfect, but we can always work to improve our character daily. “Qualities of honesty, courage, or the like; integrity." 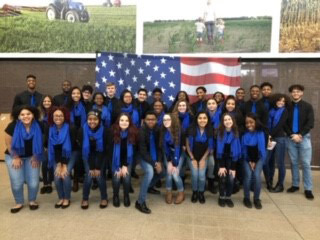 The East Stroudsburg North High School Choir, directed by Mr. Keith Labar, had the honor of singing our national anthem as they opened the 2019 PA Farm Show this week. As always, great job students and Mr. Labar! You can view their performance here! Year after year, my colleagues and I do our best to raise awareness for Alzheimer's disease and dementia, and promote local community programs which can assist Pennsylvanians who are caring for or who are experiencing these diseases. This past October the House unanimously passed a resolution which urged the Secretary of Health to declare Alzheimer's disease and other related dementias as a public health issue. Therefore, I want to inform you of two locally run programs that are held at the Friendly Community Center (6683 Route 191, Mountainhome) which are available to help those dealing with this debilitating disease. They host an Alzheimer's and Dementia Café, which occurs on the second and fourth Tuesday of the month from 1-2:30 p.m. This program allows those suffering from these diseases to enjoy an afternoon of shared activities with their caregiver. Activities include games, educational programs, music, art and other shared experiences. This program also offers support to caregivers and a way to enjoy activities together as a break from the normal routine. This program is offered to persons still living at home and their caregivers and is free and open to the public. They also host Music Therapy for people living with dementia. You can bring your loved ones to interact with others through instrument playing and singing. This program takes place on the first and third Tuesday of the month beginning at 1 p.m.
On Wednesday, Jan. 23, Pennsylvania CareerLink will hold a Veterans Job Fair at Northampton Community College – Monroe Campus from 10 a.m. until 2 p.m. The Fair will be held in Pocono Hall, room 108. Please call 570-620-2858 with any questions. As each of us travel to various medical, professional or business facilities and seek parking, we readily see spaces that are reserved for those with disabilities. Sadly, we also note that some people who are not properly authorized to use these spaces do use them. Such misuse shows neither proper respect for those who do have disabilities, nor for the law. According to the Commonwealth’s parking lot construction standards, approximately 4 percent of a parking lot is allocated for parking spaces for people with disabilities and even less space is available for an access aisle. Given the limited availability of disabled parking spaces, individuals who legally hold a disabled parking placard or plate need these spaces to be protected and properly enforced. This year the General Assembly passed Act 144 of 2018 in an effort to modernize Pennsylvania’s disabled parking laws. Specifically, the law prohibits a person from obstructing a vehicle or part of a curb ramp or the access aisle (typically marked with diagonal lines) adjacent to a parking space reserved for a person with disabilities. Violators would face a fine of $100 to $300. The law also permits municipalities and local authorities to designate a particular space on a public street for a particular person or vehicle. Pennsylvania law authorizes towing and/or penalties for vehicles that are illegally parked in spaces marked for people with disabilities. In order to park in one of these designated spaces you must obtain and display either a person with disabilities placard or registration plate from PennDOT. These placards and plates are universal and accepted in all 50 states. You must meet certain criteria and have your disability certified by an authorized health care provider, law enforcement or a U.S. Department of Veterans Affairs Regional Office Administrator. For additional information, click here. For assistance in obtaining or submitting an application for a placard or registration plate, please feel free to contact my East Stroudsburg district office at 570-420-8301. In recognition of January as Cervical Health Awareness Month, residents are reminded of the Commonwealth’s HealthyWoman Program, a free breast and cervical cancer early detection program for those who are not insured or whose insurance doesn’t cover the screenings. Nearly 13,000 women in the United States are diagnosed with cervical cancer each year, but the disease is virtually always preventable with vaccination and appropriate screening. The most common form of cervical cancer starts with pre-cancerous changes that can be found and treated before they turn into cancer. The changes do not have symptoms but can be detected through regular screening. Among the services offered are pelvic exams, Pap smears and follow-up diagnostic tests for an abnormal screening result. Cervical cancer screenings are recommended for women beginning at age 21. For more information, call the HealthyWoman hotline at 1-800-215-7494 or click here. As the New Year starts, the Pennsylvania Department of Military and Veterans Affairs (DMVA) suggests veterans review the benefits they have earned through their service. Veterans should check with a veterans service officer to see if a change in their circumstances or in benefit policies could make them eligible for different programs. Veterans are encouraged to apply for federal health care and state benefits by visiting their local county director of veterans affairs or area accredited service organizations. County directors can be found by clicking here. Additionally, American Legion Service Officer Brian Stolarski visits my East Stroudsburg district office each month to assist veterans with their benefits. He is here on the second Thursday of each month, from 10 a.m. to 2 p.m. You must call our office and make an appointment at 570-420-8301. He will be here next on Feb. 14. DMVA officials stress that veterans and their dependents should never pay for help to apply for benefits. There are about 200 veterans service officers in Pennsylvania who work with organizations such as the DMVA, county veterans affairs offices, and several veterans service organizations available to provide assistance at no cost. To get timely information about state benefits, programs and services, veterans are urged to sign up for DMVA’s Veterans Registry at register.dmva.pa.gov. An expansion of the state law designed to protect roadside workers is now in effect in Pennsylvania. Act 83 of 2018 adds trash haulers to the list of vehicles, including stationary tow trucks, mail delivery vans and other vehicles involved in performing a roadside service, to those for which a driver must slow down when passing. Drivers are required to move at least one lane away when possible or slow down and be ready to stop if they cannot. This law is in addition to the “Steer Clear” law requiring drivers to move over when approaching an emergency response scene. - Driver’s license and vehicle registration applications and renewals. - Assistance with PennDOT paperwork (lost cards, changes, corrections, special registration plates, vanity plates, and temporary placards for disabled persons). - PACE and PACENET applications for seniors. - State Motor Vehicle and Driver Licensing Work. - Voter registration forms and absentee ballot applications. - Free state maps, state park information, and PA Vacation Guides. - Copies of legislation and tours of the State Capitol. - Referrals to agencies to resolve state-related matters.